Harry Belafonte accepts the Jean Hersholt Humanitarian Award onstage during the Academy of Motion Picture Arts and Sciences’ 2014 Governors Awards at the Ray Dolby Ballroom at the Hollywood and Highland Center in Hollywood, Calif., Nov. 8, 2014. The legendary Harry Belafonte received the Jean Hersholt Humanitarian Award from the Academy of Motion Picture Arts and Sciences on Saturday and had a few words for Hollywood during his acceptance speech. The veteran actor and humanitarian was referred to by Susan Sarandon as "the ultimate example of a great artist and lifelong social activist." Belafonte's activism and humanitarian work spans decades, from marching with Martin Luther King Jr. to opposing apartheid in South Africa. 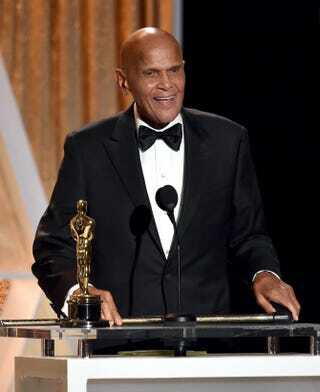 During his acceptance speech, Belafonte urged Hollywood to change its ways. "I really wish I could be around for the rest of this century, to see what Hollywood does with the rest of the century. Maybe, just maybe, it could be civilization's game changer. After all, as Paul Robeson said, artists are the radical voice of civilization," said Belafonte. "Each and every one of you in this room, with your gift and power and skills, could perhaps change the way in which our global humanity mistrusts itself. Perhaps we as artists and visionaries for what's better in the human heart and the human soul could influence citizens everywhere in the world to see the better side of who and what we are as a species." Belafonte called on filmmakers to be the catalyst for change in Hollywood as he pointed out that films like Birth of a Nation were racially damaging. Belafonte also called his friend and fellow actor Sidney Poitier to the stage, thanking him for his contributions not only to Hollywood but also to activism.